Angela Carter’s riches-to-rags story reads like an exquisitely written fairytale in reverse. Beginning in the summer Melanie turns 15, when she is swooning with the romantic possibilities of her future and increasingly enamoured with her own blossoming beauty, things swiftly turn dark. A borrowed wedding dress, an altercation with a cat and a midnight scramble up a tree spells the end of Melanie’s dreamtime as she and her younger siblings are packed off to live with their mother’s brother, an uncle they have never met. Uncle Philip, the proprietor of a gloriously old-fashioned toyshop, has all the potential to be a wonderful guardian but is swiftly revealed to be the ogre lurking at the heart of Melanie’s childhood fairytales. Foul-mouthed and riddled through with violence, he doesn’t even bother to pick up the children from the train station when they arrive, instead dispatching his wife’s brothers to collect them. Their new home above the toyshop is chilly and peculiar to Melanie, the kitchen a room “full of people’s unknown lives.” Here Melanie meets her Aunt Margaret, a thin, frightened woman, “intermittently substantial”, who hasn’t spoken a word since her wedding day. The shop itself is populated mainly by Uncle Philip’s treasured creations, but it’s in the basement that the real horror waits – “blind-eyed puppets, some armless, some legless, some naked, some clothed, all with a strange liveliness” that terrifies Melanie. It’s an immersive, uncomfortable existence that soon swallows Melanie whole. Gradually she is forced to relinquish her former ideas about the necessities of living – even hot water is a luxury here. And yet, as she finds ways to survive her circumstances, we glimpse her strength of character, which was so well hidden in the layers of her previous, easier life. Francie, Margaret and Finn each offer her crumbs of solace and comfort, and as her younger brother and sister accept their new situation she too must find a way to feel at home, or crack under the pressure. Carter builds up a sense of claustrophobia and unease, with Uncle Philip a threat that looms throughout until a catastrophic clash is inevitable. First published in 1967, the story remains remarkably timeless, like all the best fairytales. Uncanny, unsettling and riddled with Melanie’s anxiety, this is not a novel to slip into in search of comfort. Instead it’s a portrait of a girl finding her footing as she grows to understand something powerful – not everyone gets the happy ending they hope for, but perhaps that’s actually all right. 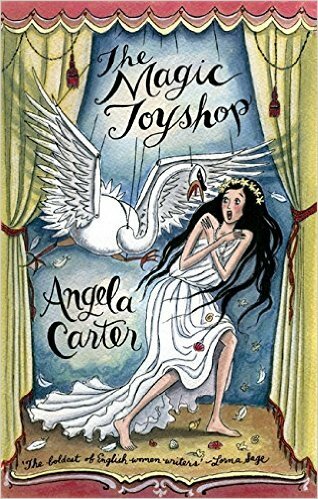 The Magic Toyshop by Angela Carter is published by Virago Modern Classics. Buy it now from Amazon. Want more? Strange Worlds: The Vision of Angela Carter is currently on at RWA, Queens Road, Bristol, BS8 1PX. This entry was posted in Reviews and tagged Angela Carter, Book reviews, The Magic Toyshop by Judy. Bookmark the permalink.